You are currently browsing the category archive for the ‘bike club’ category. The League was founded as the League of American Wheelmen in 1880. Bicyclists, known then as “wheelmen,” were challenged by rutted roads of gravel and dirt and faced antagonism from horsemen, wagon drivers, and pedestrians. In an effort to improve riding conditions so they might better enjoy their newly discovered sport, more than 100,000 cyclists from across the United States joined the League to advocate for paved roads. The success of the League in its first advocacy efforts ultimately led to our national highway system. Bicycling has grown tremendously over the years. The number of Americans who ride bicycles is greater than all those who ski, golf, and play tennis combined (National Sporting Goods Association), and according to the National Household Travel Survey, nine million bike trips occur in the U.S. every day. Sounds like a lot of people doing a lot of riding, right? Absolutely. During the past two decades, cycling has increased in the United States. The number of bike commuters rose by 64% from 1990 to 2009. Most of us ride for recreation and fitness reasons and commuting is only a part of the bicycling story, but the statistics on bicycle commuting are an accurate indicator, not only of changing transportation patterns and choices, but also of the rise of cycling in general. In Illinois, between 2005 and 2011, bicycle commuting grew 45%; in Missouri, 73%. But enough with statistics. Bicycling is simply good for the legs and lungs, the heart and the core, good for the environment, good for the community—economically and culturally, and it is good for the soul. There are many, many reasons that people ride bicycles. Herschel Surratt, 79, of Chapin says that he started rides because it works out the soreness in his knees – his replaced knees. That, plus the exercise improves his overall health and helps combat cholesterol and blood pressure problems. That, plus “I see things I just don’t notice when I’m in a car.” And finally, “I like it.” Herschel recently has ridden as much as 50 miles in a day; and his “joke” with friends is that he’d like to ride 80 miles on his 80th birthday. Best guess is that it’s no joke, and, if it is, Herschel will provide an 80-mile punchline. Bottom Line: Whether one bikes to work or school; rides to save money or time; pumps those pedals to preserve personal health or planetary and community environment; or simply to explore one’s surroundings, National Bike Month is an opportunity to celebrate the unique power of the bicycle and the many reasons we ride. Each year the number and diversity of Bike Month celebrations continues to grow. Let’s add Morgan County to that list and work toward accelerating the momentum building around bicycling locally, as well as nationwide. Let’s celebrate the reasons we ride and invite everyone to find his or her own reasons. The Jacksonville cycling community and the community in general is invited to join Morgan Cyclists and friends in the 2015 Ride of Silence. Indeed, join cyclists worldwide in a silent slow-paced ride (10 mph, no more) in honor of those who have been injured or killed while cycling on public roadways. Why? To honor those who have been injured or killed. To raise awareness that bicyclists are here. To ask that we all share the road. Ride: 7:00 (at the latest). Ride slowly. Ride silently. Ride respectfully. Start/Finish: Passavant Area Hospital Courtyard. Enter hospital campus on Founder’s Lane, proceed to park on north side of campus. Brief ceremony in courtyard. Ride will begin at the North Entrance. Route: START at Passavant North Entrance – right to Founder’s Lane – left on Walnut – right on Webster – left on State – around south side of square and continue on East State – right on Johnson – to Foreman Grove – enter park and loop around , then right on Johnson – left on College – across town – right on Westgate – right on Walnut – left on Founder’s Lane – FINISH. On May 20, 2015 at 7:00 PM, the Ride of Silence will begin in North America and roll across the globe. Cyclists will take to the roads in a silent procession to honor cyclists who have been killed or injured while cycling on public roadways. Although cyclists have a legal right to share the road with motorists, the motoring public often isn’t aware of these rights, and sometimes not aware of the cyclists themselves. In 2003, Chris Phelan organized the first Ride of Silence in Dallas after endurance cyclist Larry Schwartz was hit by the mirror of a passing bus and was killed. The Ride of Silence is a free ride that asks its cyclists to ride no faster than 12 mph, wear helmets, follow the rules of the road and remain silent during the ride. There are no sponsors and no registration fees. 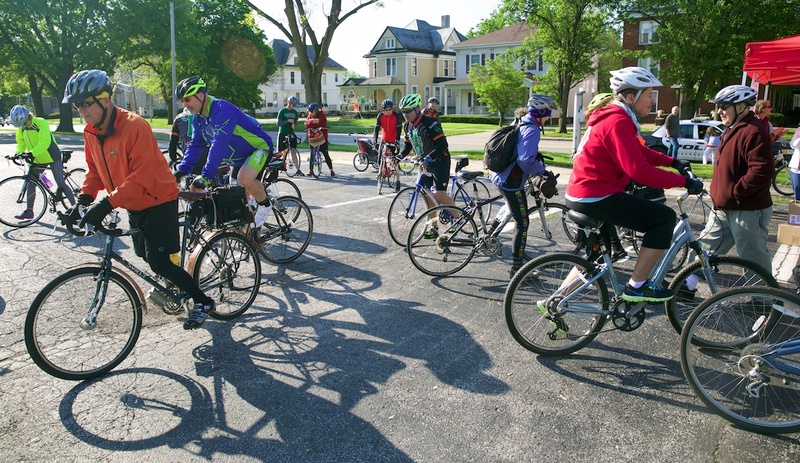 The ride, held during National Bike Month, aims to raise the awareness of motorists, police and city officials that cyclists have a legal right to the public roadways. The ride is also a chance to show respect for and honor the lives of those who have been killed or injured. Last year: 315 events – 49 states of the U.S. – 22 countries – seven continents. Thousands of bicyclists riding in unison. Join Morgan Cyclists. Join your friends and neighbors. Join the rest of the world. See a list of rides for May, and links to join Morgan Cyclists bike club. See March 18 post for background on the bike club. Here’s how to join . . . Celebrate Earth Day 2015 Wednesday April 22nd by taking a bike ride. Ride the State Street Bike Route or mountain bike along the Town Brook, maps will be available at The Soap Co. Coffee House on the northeast side of square in Jacksonville. Or meet there at 5:30 pm to join the Morgan Cyclists in a longer ride. (Link to The Soap Co. on Facebook.) Say you’re coming via Facebook event. Morgan Cyclists will have a short ride of about 11 miles (it’s there-and-back, so you can turn around short of the destination if you’re not up to that distance yet) and a longer ride of about 18.5 miles. Thanks to Darren Iozia for mapping out the rides. Nicole will have Soap Co. open, with specials for those arriving by bicycle. If your bike is under the weather, walk or run downtown instead (then head to Village Cyclery to get fixed up for the next weekly ride). Parking is limited on the square — so consider keeping your car in the lot north of Hamilton’s, or even better yet ride to the start. State Street was built for streetcars, is relatively low traffic, passes many of the historical sites in town as well as parks and attractions. Take a ride of whatever length, and join in the festivities. The city already owns land along the Town Brook from MacMurray College to Illinois College/Turner Junior High School. Get your fat tires on the grass and ride the length of the creek, see some sights, and get some exercise. Also, mark your calendars for Bike to School Day Wednesday May 6th. Who are the Morgan Cyclists? There’s about 50 members, all different levels of bicycling, who want to have a relaxed atmosphere for a ride. Set your own pace, pick your own pack — just get out and have funs. Rides every Wednesday.